In most cases, a new iOS version would fix some bugs of the old version and bring some new features, so the majority of people are willing to make an iOS update. However, sometimes the update may fail or someone does not like the new iOS version and they want to downgrade from iOS 12 to previous version. Then how to downgrade iOS 12? This tutorial can tell you. Part 3. How to Downgrade from iOS 12 to Previous Version? It is known to all that the risk of iOS downgrade is much higher than iOS update. Thus, to ensure the safety of your iDevice as well as the files, you ought to know something important before starting the downgrade. The iOS downgrade is a little bit complex and time-consuming, so please be patient while performing the downgrade. You should not interrupt the downgrading process or your phone data or system settings might be damaged. To accomplish the downgrade, you should first go to ipsw.me to download the wanted iOS version. But on this website, the still signed IPSW file is only on iOS 11.1, iOS 11.1.1, iOS 11.1.2 and iOS 11.2. That means you can only downgrade your iPhone/iPad from iOS 12 to iOS 11.1/11.1.1/11.1.2/11.2. Other earlier iOS versions are not signed now. After you uninstall iOS 12, you will be unable to restore your device with the backup that you created before the downgrade. If you want to get back the files, you should turn to some tools like iOS Data Recovery. Normally, the downgrade should be harmless but it also has the potential to brick your iOS device. Hence, in order to prevent the files on your device from losing, backing up the data beforehand is suggested. No one knows what will happen during the downgrading process. Thus, you are suggested to make a backup before performing the downgrade. 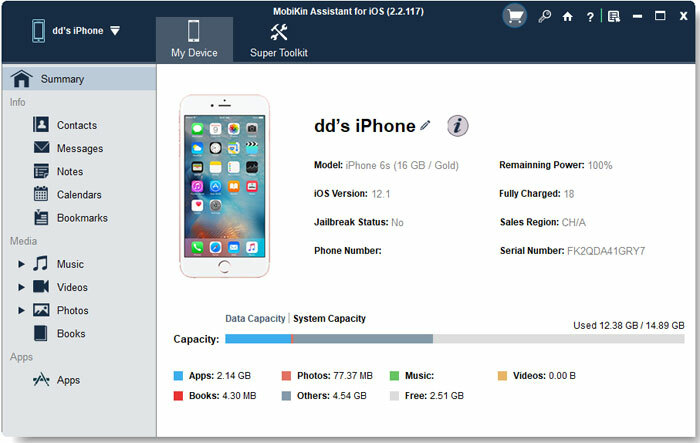 Here, you can use the free third-party software called MobiKin Assistant for iOS to simply backup your files. This program allows you to sync the iPhone/iPad/iPod files to computer with several clicks. In addition, it enables you to repeatedly backup the files to iTunes with one click. You can click the icon below to try and use the software for free. How to Downgrade from iOS 12 to Previous Version? Step 1. Go to ipsw.me to download the previous iOS firmware for your device and save it onto your computer. Step 2. Turn off the "Find My iPhone" service on your iDevice and use a USB cable to link your iPhone/iPad to computer. Step 3. Launch iTunes on computer and put your device into DFU mode by pressing the "Power" and "Home" buttons simultaneously > releasing the "Power" button after the Apple logo appears > releasing the "Home" button when you see the "Connect to iTunes" prompt. Step 4. After that, iTunes will prompt that it has detected an iPhone/iPad/iPod in recovery mode and ask you whether to restore your device. Just tap on "OK" to allow the restore. Step 5. Tap on your device in iTunes and then choose "Summary". Next, you need to choose the "Restore iPhone" option. For Windows, you can hold down "Shift" and click on "Restore iPhone (or iPad/iPod)..."; for Mac, you can press "Option" and click on "Restore iPhone (or iPad/iPod)...". Step 6. Find out the iOS ipsw file that you have downloaded and choose it and tap on "Open". Then a window will pop up to tell you that you are going to downgrade to previous iOS software and the process will erase all data on your device. You can hit "Update and Restore" to continue. Step 1. Download the ipsw file on your computer. Step 2. Connect your iDevice to iTunes and go on to choose your device. Step 3. Then you should go to "Summary" section and press "Check for Updates" while holding down "Option" (on Mac) or "Shift" (on PC). Step 4. Next, navigate to the ipsw file that you have downloaded before and start to install the iOS file. That's how to downgrade iOS 12. If you decide to perform a downgrade, please make full preparations beforehand and be careful during the process. This can help to better protect your device and ensure the smooth going of the process. [Fixed] iPhone Can't Make or Receive Calls after iOS Update? 7 Tips to Solve It! iPhone Sound Not Working: How to Fix iPhone No Sound Issue?